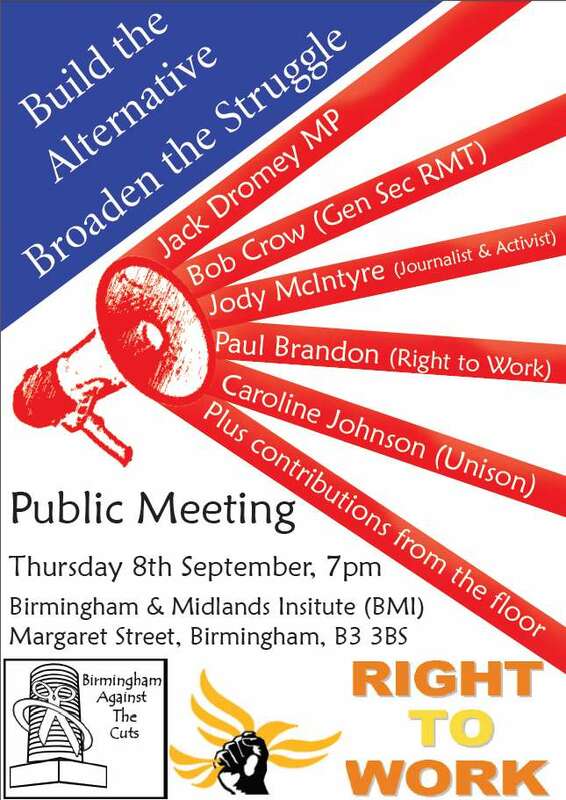 SWAN, DPAC, Unison, Right to Work and Birmingham Against the Cuts held a joint public meeting this evening, examining the cuts to social & care services being brought in by the local ConDem coalition. 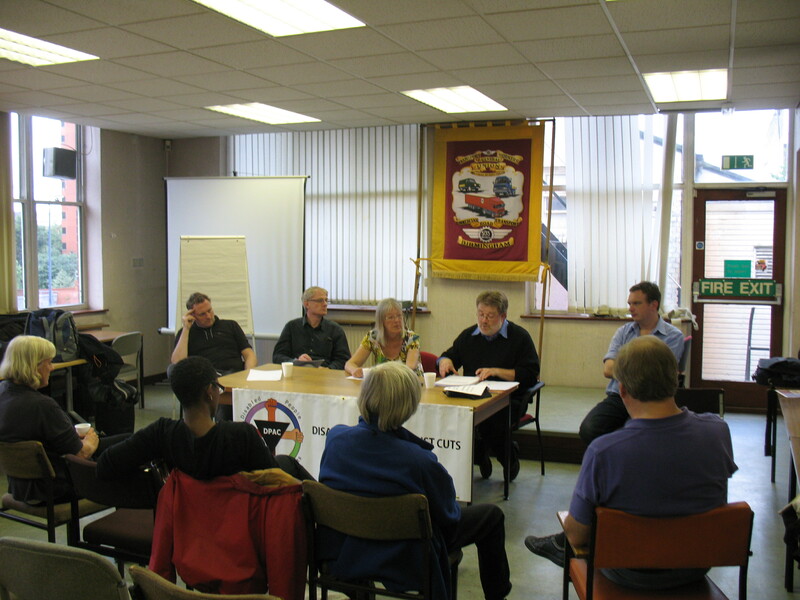 The meeting was chaired by Caroline Johnson from Birmingham Against the Cuts and Unison. 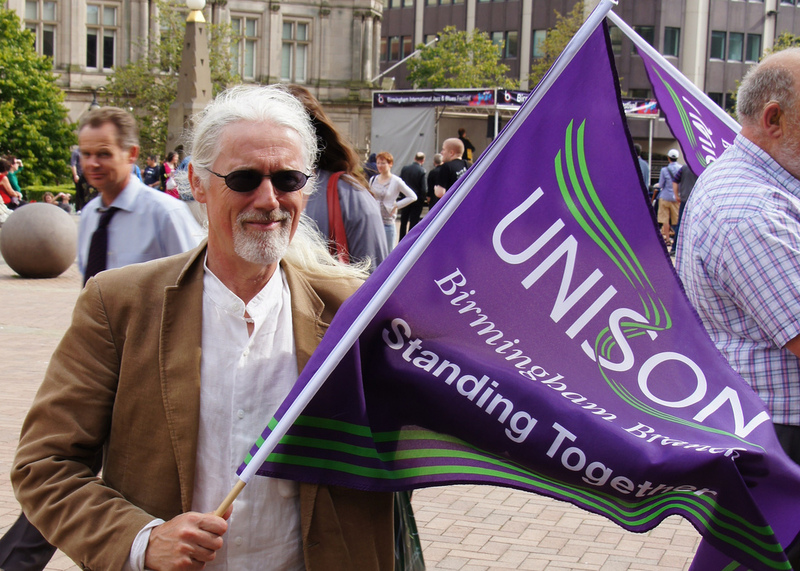 The first speaker was Graeme Horne from Unison, who told us about the level of cuts to social care services in Birmingham. Adult care services are facing 16%-17% budget cuts this year, with cuts over 3 years totalling 40% of the budget – and that doesn’t take into account inflation, which could easily see real terms budgets shrinking by 5% year on year. The outcome of these cuts – part of the council budget cuts approved this year by the ConDem coalition in Birmingham – is that they will only support those judged to have “critical” needs. Explaining the system, Graeme told us that there are 4 levels that needs can be assessed at – Critical; Substantial; Moderate and Low. Previously, those judged to have substantial needs would have been supported, but now they will only support the critical needs of those judged to be in the critical category (so someone with critical needs will not get support with needs considered to be moderate). To illustrate what the difference is in the categories, Graeme told us that one of the criteria is that a need is “critical” if the person is at risk of, or has experienced, serious abuse or neglect, whilst a “substantial” need is someone at risk of or has experienced abuse or neglect. So the abuse must be “serious” for someone to get support. These cuts will remove support from 4,500 adults around Birmingham – 30% of all those currently supported by the council. Next to speak was Simon Cardy from Social Work Action Network (SWAN). He works in childrens care, and talked about the issues of backdoor privatisation and ideology in the upcoming struggle to defend care and support services. 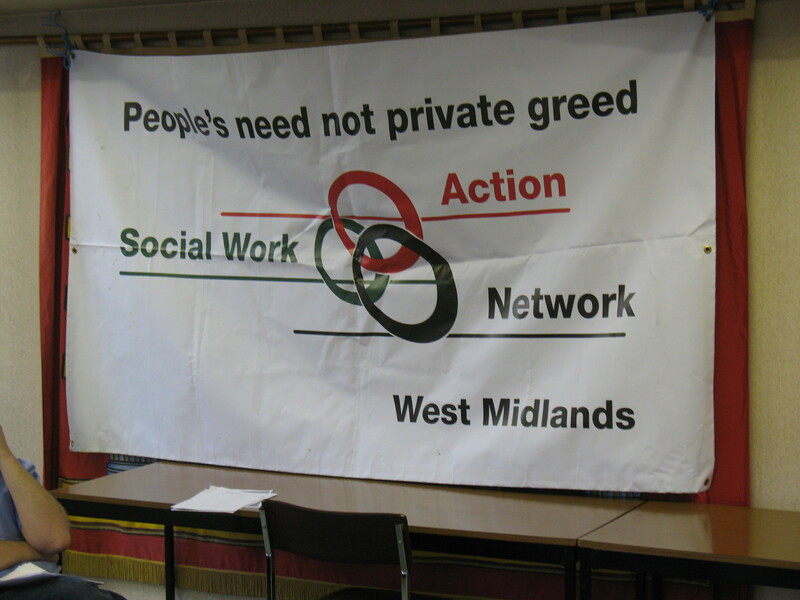 He talked about a pilot for a Social Work Practice (essentially a small grouping of social workers in a social enterprise – think on the scale/model of solicitors practices) in Sandwell, and how it failed because social workers refused to volunteer for the trial, knowing that it was a path to privatisation, and then collapsed when Ofsted said that the council needed to consult the children affected. He attacked the ideology of both the current coalition and the previous Labour government for introducing market based ideas into social work and called for an end to quasi-business practices and models being used for public services. Linda Burnip from Disabled People Against the Cuts (DPAC) also talked about the 4,500 people facing the loss of their support services. Having substantial needs means that you need help to get up, to get out of the house and to go anywhere. The biggest worry is that people will become unable to leave their house. I know people who would like to have attended the meeting tonight, but simply don’t have enough hours of support allocated to them to allow them to do it. She then told us of a woman in Kensington and Chelsea, who is 62 and has worked all her life. She had a stroke, and now has to go to the toilet every 2-3 hours. Kensington and Chelsea council have decided to withdraw nighttime care, and instead give her incontinence pads. She is not incontinent, but simply needs help to get up out of bed and get to the toilet in order to use it. The supreme court decided that it is acceptable for someone to be put into bed at 8:30pm and left there until 8:30am the next day. There is rightly concern that other councils will see this ruling and also remove nighttime care. In the discussion after the meeting there was a call to take this to the European Courts, or even to the UN and to contact NGOs like Amnesty International to raise awareness of the effect that cuts to care and support services are having, and what we can do about it. Linda mentioned some alternatives, including ending tax avoidance and evasion, and talked about upcoming events that disabled people could get involved in. There is a protest tomorrow in Kensington and Chelsea about the decision to remove care. 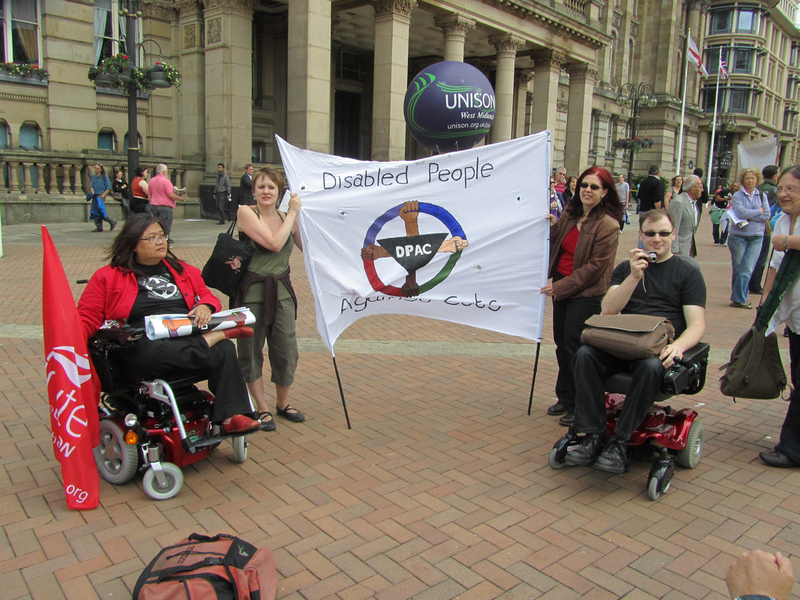 They are intending to setup a Birmingham DPAC group which will be active in the city. At the Lib Dem conference in September, they are going to target Maria Miller, the “so-called minister for disabled people”. 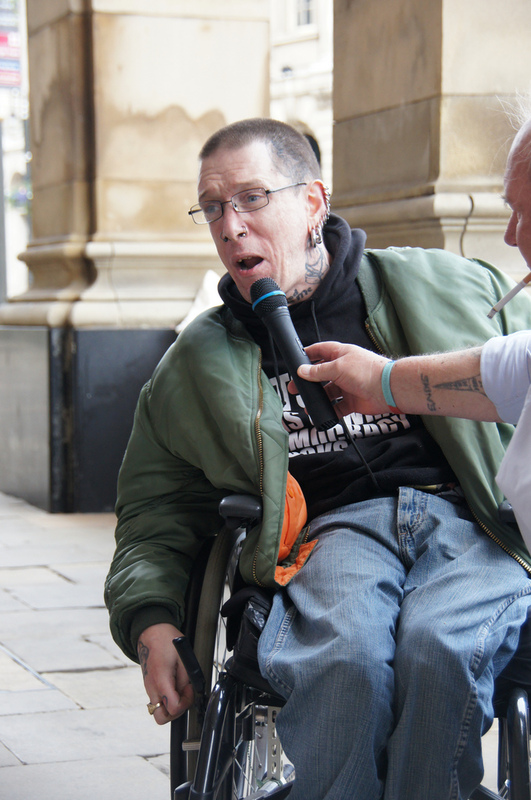 So there is action coming up that around the UK to defend people who need these services. He said that the government were very good at talking up the line that there is no alternative, but the reality is there are plenty of alternatives. You can read more about the alternatives to the cuts on False Economy, or our series on alternatives. Brian said that the government is relying on there being too many cuts for us to fight them all, but that we need to fight all of them and we can do it. 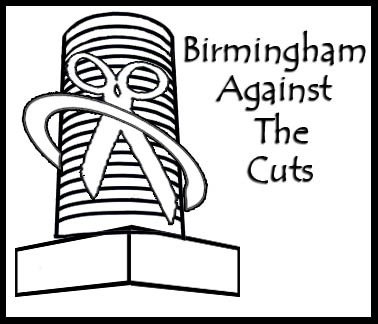 Birmingham Against the Cuts is an umbrella organisation working in this city you can get involved with. You are already reading the website, you could join our monthly e-mail newsletter list, like our facebook page and/or follow us on twitter to keep up with what we are doing, you can see events that you can come to on our upcoming events page, or you could get more involved by attending one of our planning meetings. The final speaker on the panel was Paul from Right to Work. Paul outlined a strategy for fighting the cuts, saying it needed now to compose of three parts: Strikes, Direct Action and Occupations, and that we also need to offer an alternative. On strikes he said 30th June was incredibly important and that in the Autumn there would be more strikes. Direct Action makes headlines and exposes what is going on, we need more of it. With occupations he said that at Bombardier meeting there was talk of occupying the factory if the government did not reverse its decision, and that he felt more of this would be needed. He also mentioned the Liberal Democrat conference demo on 18th September in Birmingham, and the Tory conference demo on 2nd October in Manchester. 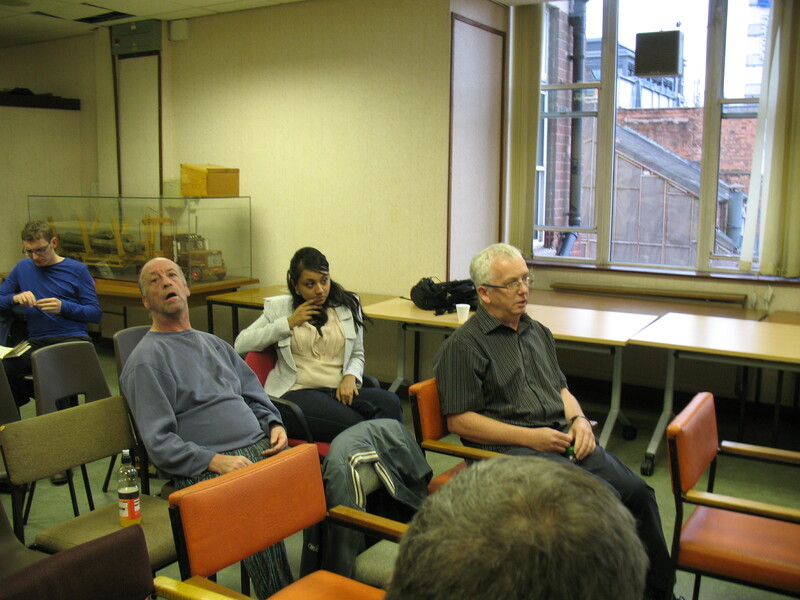 There followed a discussion from the floor, with many people speaking, which was great after the unexpectedly short time available at our last public meeting. The DWP protest on Monday was mentioned, as were Stop the War activities. 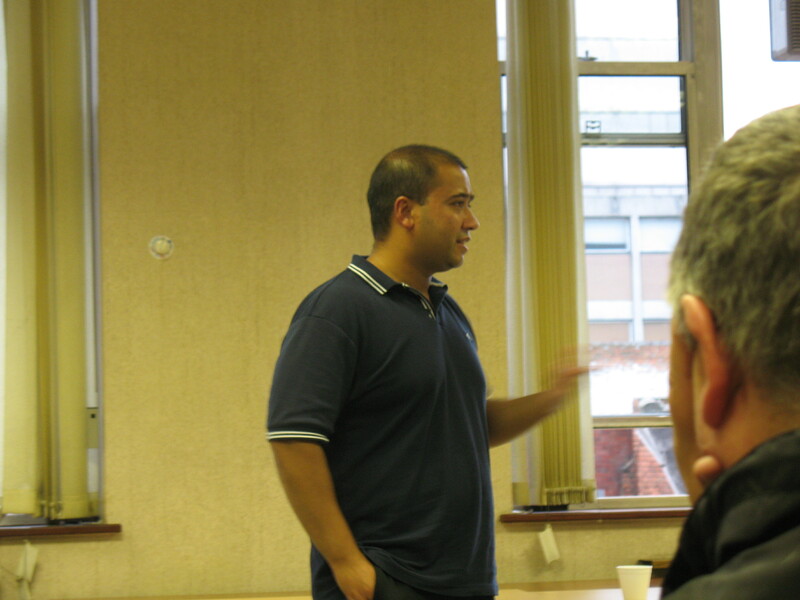 Two speakers (Abu Alamgir and a gentleman whose name I didn’t catch) raised the question of what electoral parties will be options for us to vote for as Labour do not seem to be opposing cuts fully – the prospect of anti-cuts candidates standing at the next election was raised. Bob Findlay-Williams spoke about the question of accepting the ideological framework that these cuts are framed in, that he wants to smash the concept of community care because it is a concept built on capitalist ideology. Not everone needs care, they might need support or equipment but the mainstream wraps that up in the word care which reinforces ideas of dependency. Sam Brackenbury called for direct action, referring to the Iraq War marches of 2003, he asked whether it might have succeeded if the people decided they weren’t going to leave. Marching has it’s place, but once you’ve gone from A to B you’ve got to think about what’s next. He said that he is honestly worried about cuts to support services and benefits and how it might affect him. Matt Raine said that the conference demonstrations provide a good place to build numbers to take direct action in the future. There was talk of the Tory conference planning for up to 100,000 people, whilst the aim for the Liberal Democrat conference should be 20,000-30,000 people. There was also more talk of the need to push our alternatives, and to be sharper at doing it. One alternative that was mentioned was the cost of war – Trident costs £38.5million every week, whilst Afghanistan costs £4.5bn and hundreds of millions are being spent on Libya. 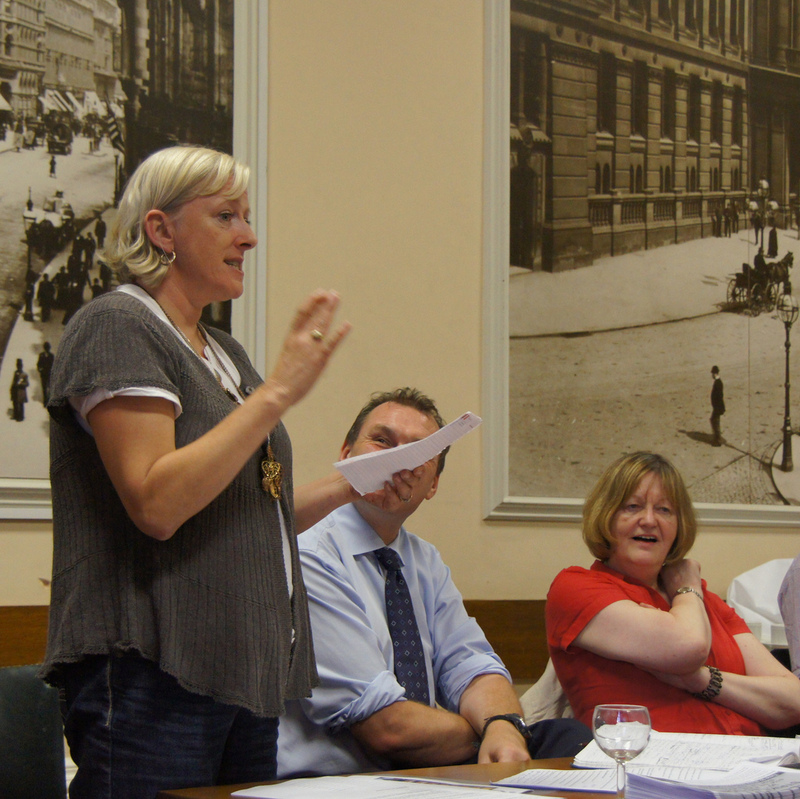 The speakers rounded off the meeting with comments on what had been said from the floor, and the announcement of a pamphlet being produced on the issue of the removal of care and support services from 4,500 adults in Birmingham and what we can and are doing about it. False Economy is a good website to start with to explore the alternatives to cuts, and the reasons why they will not cure the deficit problem. 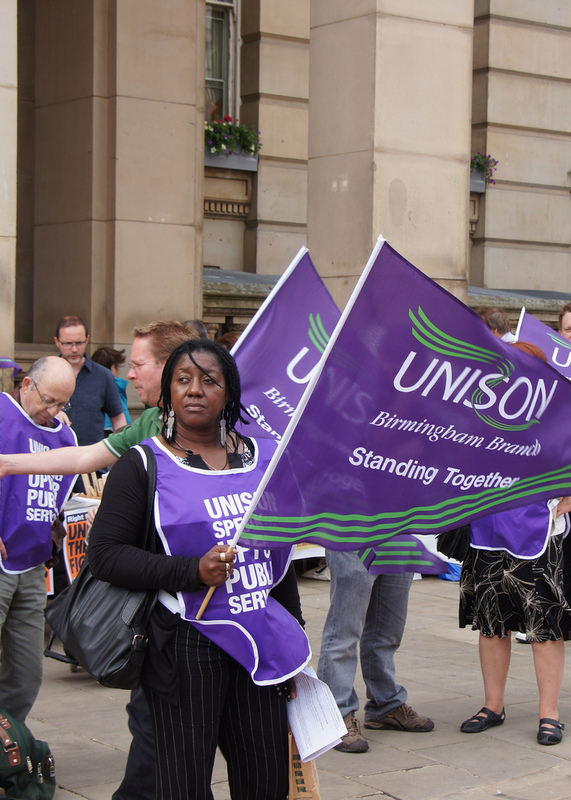 July is going to be a month of action on Birmingham care and support services, with UNISON, DPAC, SWAN, RtoW and BATC coming together to campaign on vital services being attacked by the ConDem council cuts. 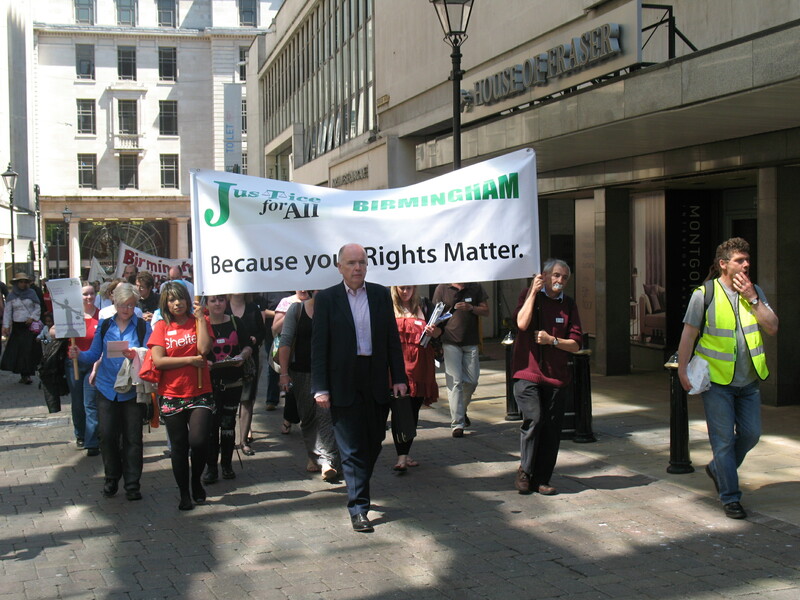 As announced at last week’s Victoria Square rally, a lobby of the next full meeting of Birmingham City Council will take place tomorrow, 5th July at 5.00pm to protest about the council’s plans for savage cuts to adult social care services, their plans to privatise social care services and social work, and the Government’s attacks on benefits for Disabled People. 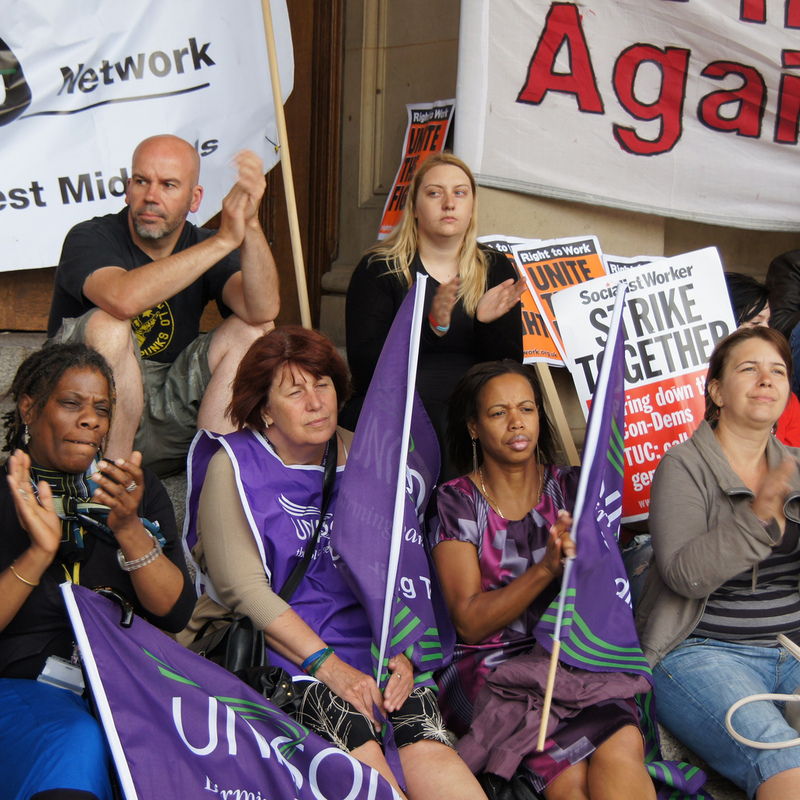 The rally has been called by UNISON Birmingham Branch, Disabled People Against The Cuts (DPAC), the Social Work Action Network (SWAN), the Right To Work Campaign (RtoW) and Birmingham Against the Cuts (BATC). 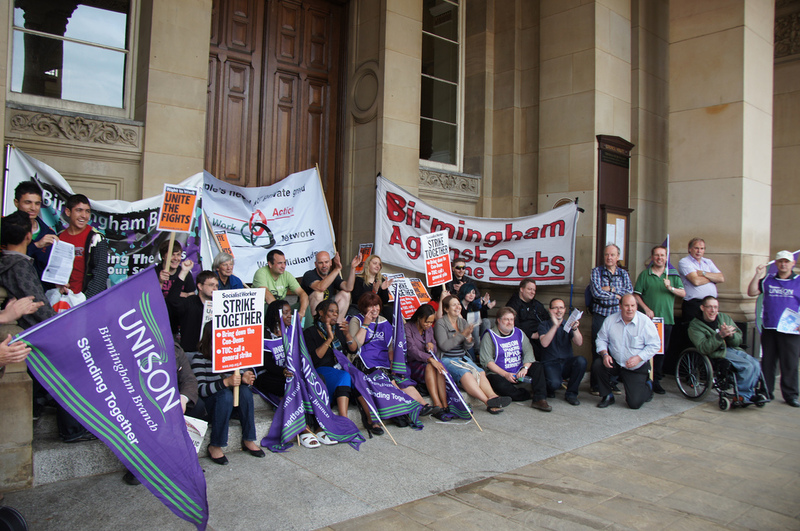 This is the last Birmingham Council meeting until 11th October. So we have to protest NOW. Birmingham plans to cut over £33 million from adult social care services this year alone. This will rise to £118m by 2014/5, or around one third of the £330m cuts the council will make. 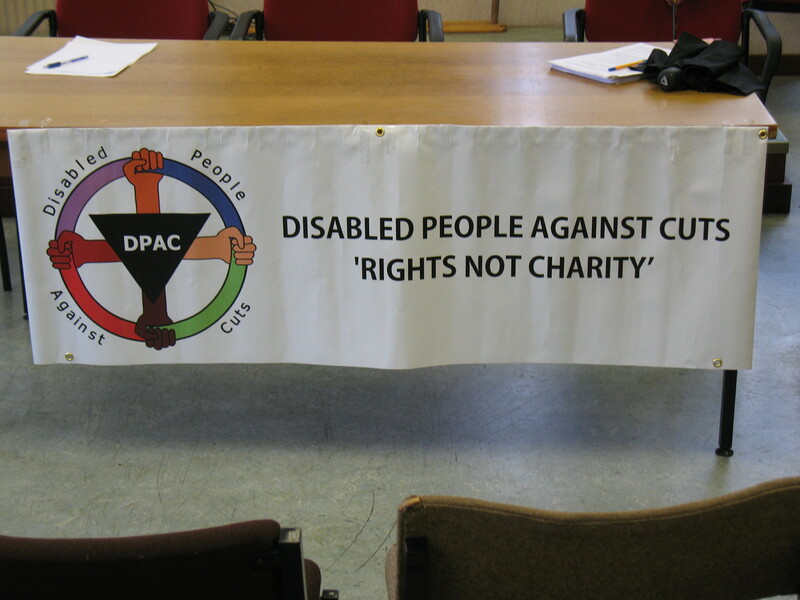 In May 2011, a High Court Judicial Review ruled the cuts unlawful as the council had not fully carried out its obligations under disability discrimination legislation. Birmingham City Council Chief Executive, Stephen Hughes, has told Birmingham staff that there will be another public consultation process later this year. At the same time, Birmingham City Council is also preparing to privatise its adult care assessment and care management services into a ‘social enterprise’. They are currently setting up a private company to provide social work services for disabled people in the north of Birmingham under a Social Work Pilot scheme. Wholesale closures of in-house adult social care services are expected over the next two years, with transfer of services to the private sector. This rally presents an opportunity to raise public awareness of the heavy burden of cuts being carried by disabled people and older adults . We will be reaching out to service user and carers groups throughout the city to take part in the consultation exercise to defend social care provision for older adults and disabled people. The protest rally will also be highlighting proposed changes to benefit systems for health and disability related benefits. Campaigners are vigorously opposing the new medical assessment process for benefit entitlement run by the private firm ATOS. 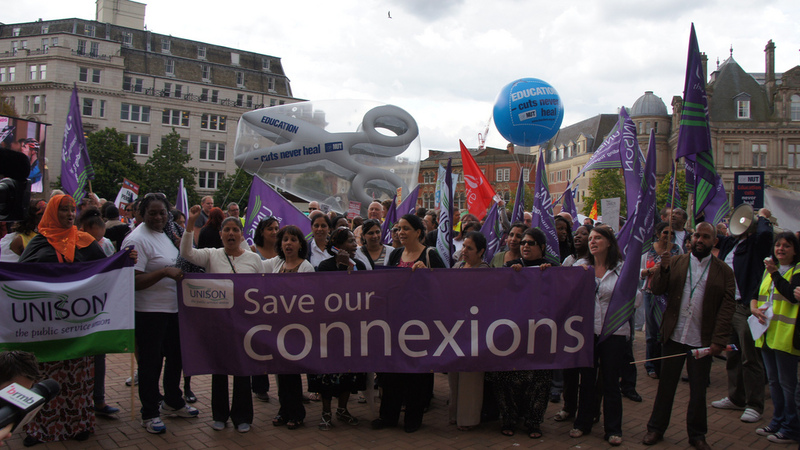 Email us on handsoffbrumservices@gmail.com if you would like to take an active part in our campaign. Around 30 protesters, including representatives from Birmingham Against the Cuts, gathered at Sparkhill Job centre because Ian Duncan-Smith – tory minister for work and pensions (DWP) was paying a visit. 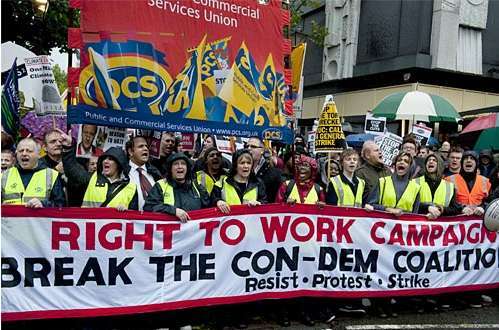 The tory cuts will affect job centres directly, with threatened redundancies, and indirectly with rising unemployment increasing their workload.